After a couple weeks of open voting and a fairly good sample size, one conclusion is clear: there is no single winner in the .NET O/RM space. Running away with 32% of the vote is the ambiguous "other" category, which means respondents use one of the (seemingly) hundreds of .NET O/RM tools not listed explicitly in this survey. But more on that later. 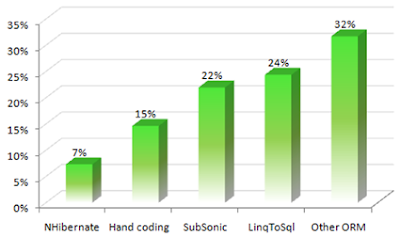 What I found most surprising in these results is how popular LinqToSql and SubSonic are versus old vanguard NHibernate. By all measures, NHibernate- which has its roots in the Java Hibernate project- has more features and power than LinqToSql or SubSonic, but clearly those features aren't winning as many users as I would have guessed. The fact that SubSonic and LinqToSql polled so highly indicates to me developers are more interested in tools that make O/RM easy versus providing every configuration point possible. Also interesting in these results is the fact that only 15% of respondents chose to do O/RM work by hand. That means the other 85% of you chose some O/RM product or another to help you manage your data access and business objects. That begs the question, "Why do 15% choose to code their O/RM by hand?" Price of O/RM solutions? Available features? Stubbornness? Whatever the case, if you're hand coding your O/RM, you're in the minority. Finally, the "other" category opens up an interesting area for follow-up. Which .NET O/RM products are you using that I did not include in the survey? I'd be very interested to hear in the comments from those of you that voted "other" telling us which .NET O/RM you use. I doubt the full 32% in this category are using the same .NET O/RM, but it would be interesting to see if another popular choice is buried in these results. Sound-off in the comments with your .NET O/RM choice du jour and then vote in the next poll on RSS subscription habits. Frans has his roots in the demo scene and is an oustanding software architect. His product support is one of the best on the net. Yep, I use LLBLGen. Not sure how the learning curve compairs to those in the survey, but it is a fairly quick leap to understand. Using EntitySpaces, easy to use, easy to set up, easy to maintain, amazing query API, small learning curve. Works nicely with telerik controls.